This is a quick guide to get you sorted out with the pack and the changes in it. The name Proton comes as a bit of an extension to my Quark mod, and as such, aside from the big tech tree changes thanks to Better With Mods, the modpack plays very much vanilla-like. Not much is changed in the early game of the modpack. The main thing you'll want to look for is Hemp Seeds. Hemp Seeds drop from tall grass. You should be planting these, as you will need a fair amount of hemp later. Do note that Hemp can grow two high, and you probably should let it reach that, so you can get a positive output in seeds. Prepare to make ample use of JEI soon, as you will need it to look up recipes. If you're new to this thing. On the right of your inventory there is a list of items. Press the R key on one to see its recipe. The U key will give you what it can be used for. Time to get started with mechanical power. Make yourself a Mill Stone and a Hand Crank. Place the crank adjancent to the mill stone so it can power it. Add some of the hemp you've farmed to the mill stone and right click the crank to power it. You'll need to do this a bit, so you may want to make two or three sets. A single crank will break if it's adjacent to more than one mill stone. With a windmill made, you'll no longer need the hand crank to operate blocks that require mechanical power. Find somewhere cool to put your new windmill and lay it down. 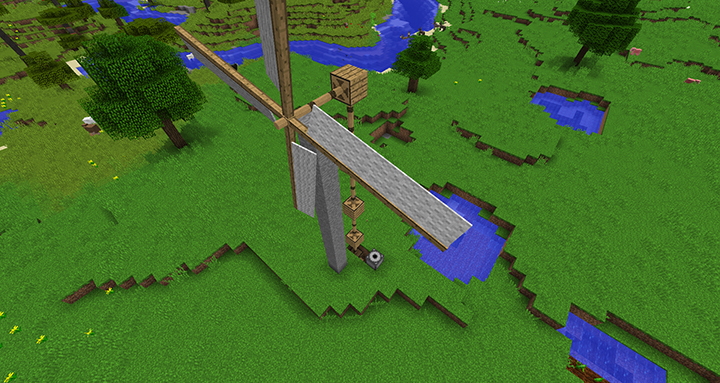 You'll need to place a axle where you want it, then right click the windmill item on the axle. This requires a 13x13 space. Mechanical power is very simple. Axles rotate, and can go on a straight line of up to 3 blocks. Any more and you'll need to place a Gearbox in between to carry on. You also need a gearbox to change the direction of the power. Gearboxes have a face with a hole and some arrows, the incoming mechanical power must be put into that side. A redstone signal will turn the Gearbox off. Make a few of them, as you will need them to bring the mechanical power down to where you can use it. Your mill stone has a hole in the bottom for mechanical power. The first thing you should power will be that, as you will undoubtedly need more hemp in the future to make axles. It's time to put this mechanical power to good use. The end goal of this step is to create a Filtered Hopper, and to unlock all of the machines here that give you access to a lot of items. You'll need to make a Cauldron block (not the one from Vanilla, the other one that has a bone in the recipe), and heat it up with fire under it. As chances are you won't have access to the nether yet (Diamond Pickaxes require tanned leather), use a Block of Charcoal and light it to heat the cauldron up. Make yourself a Knife and start right clicking some logs to get some Bark. With this, start working on making your saw. Place down your saw and give it some mechanical power (the saw can be placed sideways) and place some planks in front of the blade. You'll end up with siding blocks, these can be placed again to make moulding, and again, for corner blocks. You can also place logs in the saw for an improved plank output and some extra bark. Just don't put anything alive on it, you monster. The Filtered Hopper, which can have a filter for what goes in, and a bigger inventory space. The Saw, for better wood output. The Cauldron, which cooks food for free, somewhat slowly. Ability to make Diamond Tools, to mine Obsidian. Ability to make armor stronger than Leather. Ability to make non-wodden Rails. Ability to make Water Wheels, which do not break in a storm. The next major objective is being able to create Soulforged Steel. We'll need to make a few blocks before we can get started. Make yourself a Turntable and a Bellows. You'll also need a Hibachi, which requires Concentrated Hellfire, and thus Hellfire Dust. To make this, place a block of Soul Sand in the filter slot of a filtered hopper. Power the filtered hopper with mechanical power (this is optional, but if you don't you may unleash hell) and throw Ground Netherrack onto it. 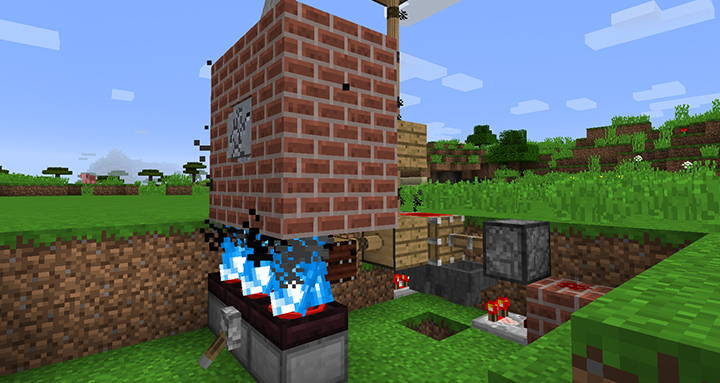 The hibachi makes fire when it has a redstone signal. Our main step here is to be able to create a Crucible. This is all done in-world, start by placing down your turntable and giving it mechanical power from the bottom. Place a block of clay on top of the turntable and it'll spin into an Unfired Crucible. You can leave it for longer to make a planter or an urn, but we won't need them right now. Now we need to fire this crucible. To do this, we'll need a Kiln. This is simply a 3x3x3 multiblock structure, in which, relative to the center, the top, bottom and at least two sides are Brick blocks. Of course you can make it bulkier if you want to make it look better. Under the center of the Kiln must be a hibachi emitting fire. The fire of the hibachi needs to be stoked by bellows to be hot enough to finish the crucible. In order to create Stoked Fire (blue fire), a bellows block needs to point towards the fire block, and mechanical power to it must be alternated between on and off, in order for the bellows to compress and lossen up. Note that the bellows must have an empty air block on top, whereas the stoked fire needs to be covered on top, or else it won't form. When stoked fire is achieved, place your unfired crucible in the center of the kiln to create the finished product. A single bellows can stoke multiple hibachis, which makes the process faster. The Crucible functions in a similar manner to the Cauldron, but it requires stoked fire (the cauldron also has special recipes unlocked by using stoked fire). So let's make our Soulforged Steel. We need a Soul Urn. Start off by making a urn by letting clay spin on a turntable for longer, and then fire it in your kiln. This gets us a regular urn. To turn it into a soul urn, place it under a filtered hopper and create some hellfire dust using it. The urn will then turn into a soul urn, allowing us to make our first Soulforged Steel with our Crucible. Our progression ends here. At this point, everything is unlocked. So let's run over what we can do now! Stoked Fire on the Cauldron, which allows for crafting Glue, Tallow, and Potash. Ability to make Dyanmite and Bomb Arrows, using Tallow. Ability to make Packing Tape, using Glue. Ability to make the Nether Furance which smelts for free in the nether, using Potash. Ability to make Eyes of Ender, using Hellfire Dust. Ability to make Redstone Wire. Ability to make Fire Arrows. Ability to make Soulforged Steel Tools. Ability to make a Block Dispenser, which can place and break blocks. There's a few other content mods in the pack other than Better With Mods, Quark and Charset. Check the modlist out. There are recipe changes to tie everything into the tiers. Chisels and Bits is included, recipes unchanged. The bit bag can hold twice as much as default. Bloodmoon is set to 1% (default is 5%). Most mobs in EnderZoo are disabled, particularly the horribly annoying ones. Extend-A-Hand is in the pack, but is creative only. The Better Than Wolves Wiki, Better With Mods is still a recreation of it, so its wiki is the best documentation for BWM. A lot of features aren't in BWM yet, so I'd only look at stuff that you can find ingame. The Quark Site, as Quark is included in the pack, having an idea of what it has is good.